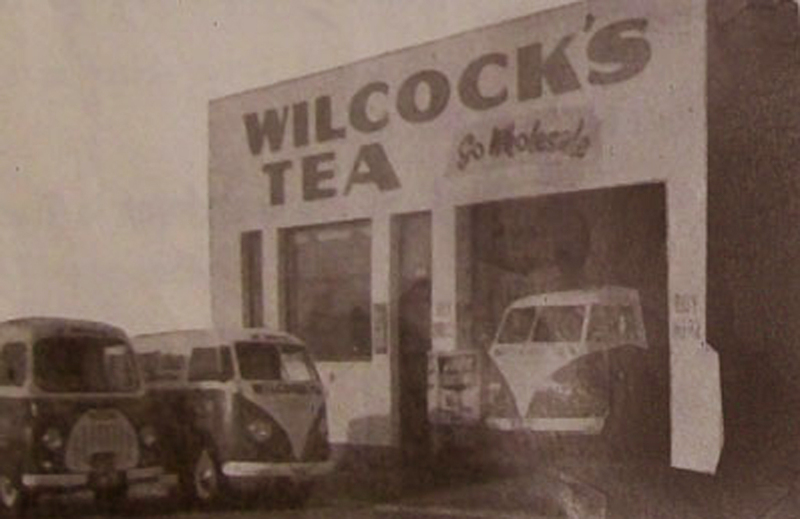 Wilcock’s Tea warehouse in Nelson Street, Auckland Central, late 1960s. Given that I am not going to know what has hit me over the next eight months, I am planning on some short and sweet posts rather than drop off the face of the planet. This opportunity presented its self yesterday when my friend Lisa Truttman of Timespanner sent me a scan from the Wises Directory of 1970, which she ran across while she was researching for a talk she is giving next month. She sent it to me thinking it may pique my interest. It did. I had never heard of Wilcock’s Tea before and I think you readers here have well and truly realised that I do like these obscure, forgotten things most of all.So inspired by Lisa’s “one afternoon photo challenge” as I have dubbed it, featured in her post A Baby’s Life, in which she set herself the task to find out as much as she could in one session about an anonymous photo – I set myself an even tighter “one hour challenge” to see what I could find out about Wilcock’s Teas. Surprisingly, quite a lot actually. Certainly more than I was hoping for (I was anticipating nothing). My first stop was the government records on the off-chance that it may tell me something about the business. First hit gave up a Thomas Lowrey/Laurie Wilcock , a retired tea merchant who passed away in 1943. So was it Lowrey or Laurie? I mean, surely someone had to be a bit more definite about the details. Apparently it was both. Taranaki Herald, 15 October 1887. Courtesy of the National Library of New Zealand. He was born in 1855 to William Wilcock, a miner, and Elizabeth Lowrey, at either Ulverston or Dalton-in-Furness (the towns were next to each other and data conflicts), Lancashire, England. He had three brothers and two sisters. He started his career as a quarryman, and then in 1871, at sixteen years old, started working as a tea blender. He lived in Dalton for a time, then married in Barrow-On-Furness in June 1876 to a Hannah Lush. They lived in Dalton-in-Furness until they left for New Zealand that year, arriving in December. By July 1879 he was working for Prudential Life Insurance in Hobson Street as a collector, but went out on his own before the year was out. He was dealing tea by 1880 in south-central Auckland and now referring to himself as Laurie Wilcock, a corruption of his middle name. Wilcock’s Celebrated English Breakfast Tea was being advertised by this year. Over those few years, his first wife had three children die in infancy , as well as one stillborn. By 1881 they are living on the corner of Oxford and Randall Streets Newton, when Hannah left him, and lived at various boarding houses around the inner city. Soon after she had a child to a C.E. Forder, with whom she had been carrying on an affair and was now shacked up with. The couple divorced due to his wife’s adultery with Forder in 1883, the article about their divorce case goes on and on in lurid detail about their every move (except the horizontal ones, thankfully). Auckland Star, 27 September 1890, Page 1. Courtesy of the National Library of New Zealand. Wilcock, not moping about at all, remarried to Mary Price Roberts the same year. The Karangahape Highway Board Valuation Book of March shows Freehold House on Lot 99 – 5 x 1 occupied by him. 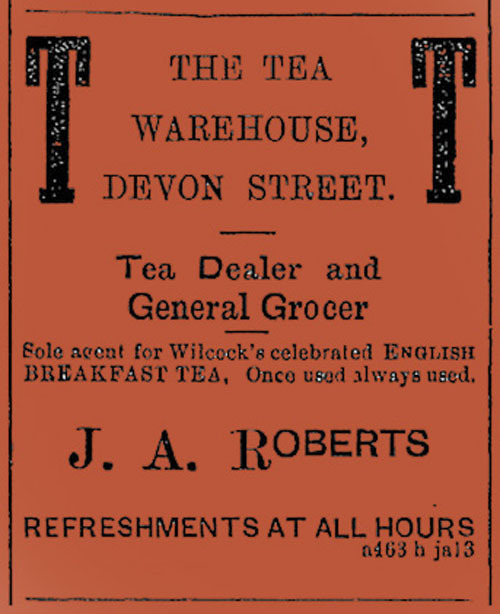 By 1890 he was running “Wilcock’s Fragrant Tea Depot” on Karangahape Road next to Forrester’s Hall, where his main modus operandi as far as advertising was offering free cups of tea to all along with Bycroft biscuits to get punters in the door. He also launched Wilcock’s Headache Tea around this time. He moved on from K Road early 1892. By 1896 he has changed the spelling of his government name to Thomas Laurie Wilcock. 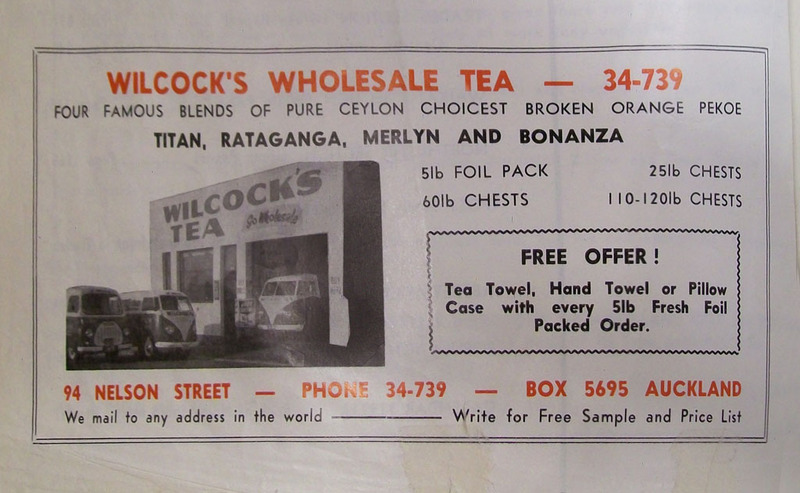 In 1911 he is living in Randolf Street, Eden Terrace at the same address as his business premises, and later has a residence at Dominion Road but still has a shop in Randolf Street, where besides tea he also sold bulk goods, soups, and coffee. His second wife died in 1919, having borne him three sons and five daughters in total. He later moved to a different address on Dominion Road. As a member of the Church of Christ through the late 1880s to the late 1930s, there are a plethora of public notices as he constantly preached and gave lectures on religious topics such as “Is Christianity a Failure?” (I could have told him it is not a failure of imagination , but a failure of fact, and saved him the time ruminating on the topic). As Laurie Wilcock he gave various sermons in Auckland as well as Wellington, and possibly travelling to other cities as well. The “Witch of Endor” all sounds very “Narnia “, and indeed she was a bit mystical, being a sorceress from the Books of Samuel, part of the old Testament. You can read more about her here. Evening Post, 22 June 1889. Page 3. Courtesy of the National Library of New Zealand. After he died, things get a little fuzzy about what happened with the business. His son Edward Laurie Wilcock (1885-1957) became a dentist, and travelled back and forth between the U.S. He possibly took over the business in later years as by 1938 he seemed to back in NZ living in Parnell permanently. The other son Leslie Thomas Wilcock (1897-), seems to have been around until at least 1949 when he took off to Fielding to become the secretary of the racecourse and was living on the grounds. He lived in various places until his death but never back in Auckland again. 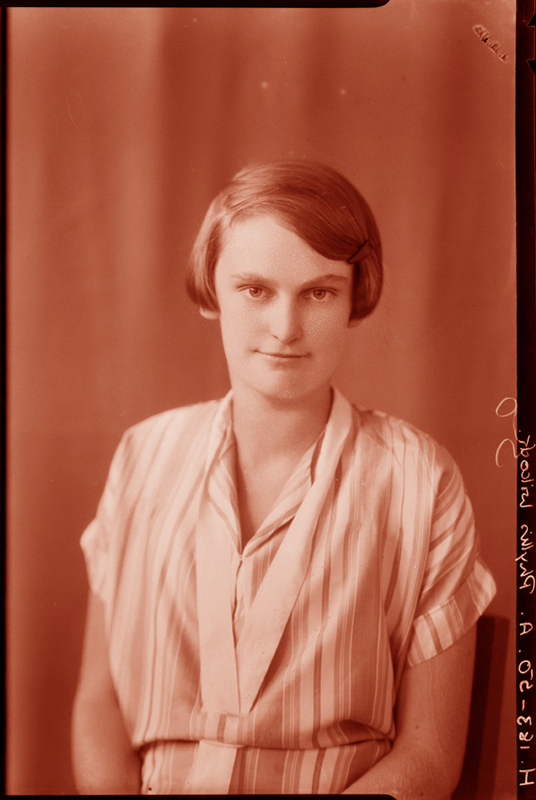 “A portrait of Miss Phyllis Wilcock.” Thought to have been taken some time between 1920-1929, this is likely Thomas Laurie Wilcock’s granddaughter Phyllis Minne Wilcock, b. 1910, Auckland. Sir George Grey Special Collections, Auckland Libraries, ref 601-H183-50-AB. Looking at the other children (Henry Samuel – who died in infancy in 1887, Ivy Muriel Wilcock 1888, Dorothy Minnie 1892-1993, Marjorie Phyllis 1894-1984, and Myrtle Madeline 1899-1978) it was only Elsie Ruth Wilcock (1890-1976) who stayed steadfast in her devotion, living with her father always, and inherited the house and highly probably the business as well. I am simply making the usual assumption that it was traditional for the sons to take up the mantle of the business – but that is not necessarily that case. Records of 1954 show the company gutting of T L Wilcock Company Limited‘s Auckland offices. Interestingly, Elsie’s husband Edmund George Paltridge died the year before in 1953. I think I have my answer as to what happened. 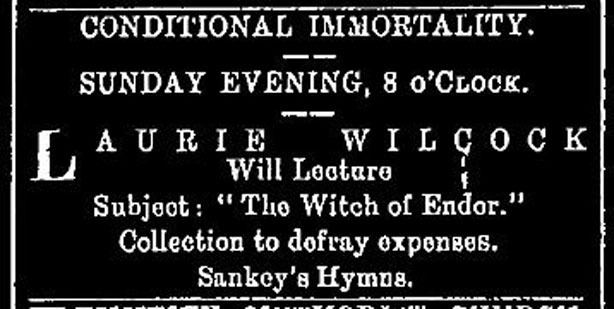 Auckland Star, 19 November 1890, Page 1. Courtesy of the National Library of New Zealand. It’s likely that they had sold the business to another party who carried on in wholesale. The building in Nelson Street that is shown in the ad of the early 1970s is now long gone and is a tower of new apartments, of course. The end. Or maybe not; I keep coming back to the fact that the first wife had a string of infants die, then as soon as she has a fling with some other bloke she’s up the duff and there’s no problem. Really, what are the chances of that? Clearly Mr. Wilcock (I only now see the pun) was not at fault here. I just find the odds curious. There was so much more about his early, life but there was that self-imposed time limit. Excellent stuff as usual! Glad the photo was of interest. You’ve made my day. Lisa. You have the wives muddled up, he married Mary Price Roberts in 1876 and Hannah Lush in New Zealand in 1883 following his divorce from Mary, who was the one who had the affair with Charles Edward Forder. Interesting read though, thanks. You are correct. I got them the wrong way around. Mary Jane Price Roberts was the first wife. Thanks. Very interesting story, thank you for taking the time to research and present such a wonderful slice of our history. I was commissioned by the new owners of the business, to restore one of the old photos of the old warehouse on Nelson Street. You can see that photo restoration here http://www.pixelfix.co.nz/blog/something-from-nothing-much Hopefully I’ve done it justice and it should now be back up on display in the company offices. Thanks for your comment Richard, I had no idea this company was still operating. Great work on the photo restoration. I have just now been made aware of this article, very interesting and well done. I can give an update on what happened to Wilcocks Tea (T L Wilcocks Ltd). was. sold in 1966 to brothers Fred and Murray Wyatt and Freds son Lance. The very successful business was sold in 1978 to Endeavour Corporation and amalgamated with ABM Ltd, Beverage Services Ltd and later with Cafe Bar Ltd.The Company was eventually broken up and sold off. Beverage Services is still trading in Manukau & Cafe Bar (owned by Australian Company Fresh Foods Ltd) is trading in Mt Wellington. The interesting story is after Wilcocks was sold, Lance Wyatt founded Mansion House Coffee with business partner Frances Hollis. They both went on to set up Burton Hollis Coffee with brothers John and David Burton. All 4 partners then founded Columbus Coffee Ltd and are still shareholders today. Lance and his son Aaron continue to roast coffee in Drury and Auckland City under the Roma Coffee and Santos Coffee brands, supply packaging as Packfresh Ltd and have somehow ended up with Beverage Services Ltd. Wilcocks Tea however seems to have sunk with out trace! Fantastic bit of company history James, thanks so much! I love this kind of stuff – when you finally get the full story. RIP Wilcock’s. Maybe one day someone will revive it as a little artisan brand or something! Hi, my husband came across your blog about my Gt Gt Grandfather, Thomas Laurie (correct spelling penned by himself in a photo I have of him with my mother) Wilcock. While I knew he had been a tea merchant, and he was a ‘West Streeter’, I was interested in finding out more in your post. Just wanted to let you know that his first wife was Mary Price (new Roberts), not my Gt Gt Grandmother Hannah Lush. (You had it the other way round). My Gt Grandfather is Edward Laurie Wilcock, who was the youngest of the 8 children Thomas and Hannah had. It was lovely to see the photo of Phyllis, who is my granny’s sister, my Gt Aunt. Phyllis died in 1969 and my granny (Elaine Lush, nee Wilcock) died in 1982. It was a lovely surprise to come across your blog!